Welcome to my new series, Dorm Design! Many of you have seen my Dorm Design YouTube videos. I've decided to start making blog posts about tips, tricks and ideas on designing your dorm! One of my favorite types of patterns is Chevron. It is very eye-catching and can add some flair to a bland dorm room. I would never do my whole dorm chevron, but adding small accent pieces or having a large focal piece like chevron bedding can transform your room! You can even be creative and make your own Chevron Walls! Instead of using paint, you can use tape or large pieces of paper. Later this summer I will have a DIY up about creating your own Chevron art! 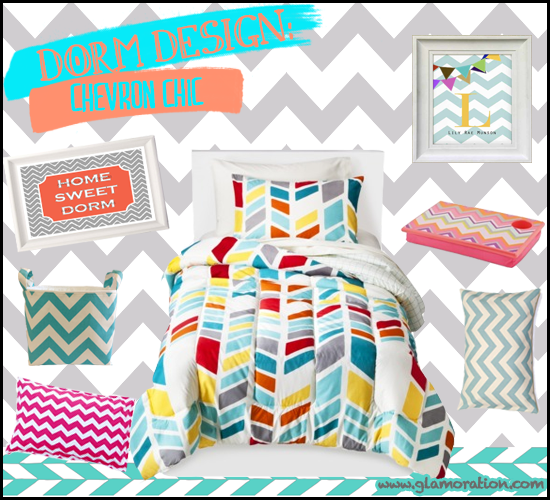 Let me know if you will be sporting Chevron in your dorm and get ready for more weekly Dorm Design blog posts! I love the chevron! so cute! I am your newest follower and cannot wait to read more of your posts and hope that maybe you can return the favor and follow my blog. I always comment back and hope to start a friendly relationship with your wonderful blog!